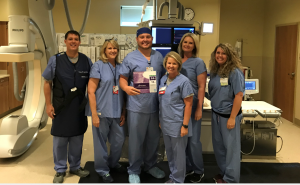 JONESBORO, AR., August 6, 2018 — The interventional cardiology team at NEA Baptist recently became the first hospital in Arkansas to offer patients with coronary artery disease the newest-generation Abbott XIENCE Sierra™ Heart Stent. In June, Dr. Anthony White, cardiologist at NEA Baptist, implanted the XIENCE Sierra heart stent in a patient with coronary artery disease. The Abbott XIENCE Sierra™ Stent makes it easier for cardiologists to access and unblock difficult-to-reach lesions. New features include a thinner profile, increased flexibility, longer lengths, and small-diameters. XIENCE stents are among the world’s most-used and studied stents and have exceptional safety standards with low rates of complications. The stent was specifically developed by Abbott for the treatment of complex cases, including people with multiple or totally blocked vessels, which now account for up to 70 percent of cases. NEA Baptist Health System comprises NEA Baptist Memorial Hospital, NEA Baptist Fowler Family Center for Cancer Care and NEA Baptist Clinic, northeast Arkansas’ largest physician group. The 228-bed hospital offers cancer care, heart care through the Heart Center, labor and delivery services through the hospital’s Women’s Center, as well as a number of inpatient and outpatient services, emergency care, and surgical services including weight loss surgery, neurology, respiratory care and pulmonary rehabilitation. NEA Baptist Clinic’s over 100 physicians practice in more than 35 specialties and offer a wealth of services, from pediatrics to orthopedic services. NEA Baptist was in the top 3% of hospitals in the nation in 2017 for receiving the Patient Experience Award and the Patient Safety Excellence Award from Healthgrades and received an “A” in Patient Safety in Spring 2018 from the Leapfrog Hospital Safety Grade. Decision Resources Group, July 2017. Data on file at Abbott.